New York City is divided into ‘boroughs’ or sections, each with their own special history and characteristics. 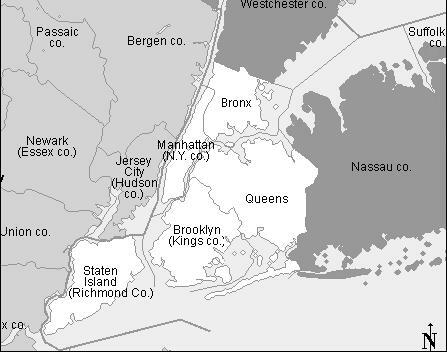 These teenage “bopping” gangs, or “clubs,” roamed the three main boroughs – Brooklyn, Manhattan and the Bronx (see map above). Over time, Queens succumbed to the gang problem as well. The gangs from that time period were different from the gangs we see today in some unique ways. For instance, in the 1950’s gangs didn’t fight over drugs. Drive by shootings were rare, and the gangs were mostly comprised of teenagers aged 12-19. Although drugs were prevalent in New York City, particularly with the rise of heroin in the late 50’s and into the 60’s, the gang wars were mostly fought over “turf” and girls. In the end, drugs helped contribute towards the demise of the fighting gang. Gang members would get hooked on heroin which would change their emphasis and world from the gang to their next fix. Junkies were notoriously unreliable in rumbles and would often be teased mercilessly or ostracized by the gang in the hope they would kick their habit and be a “productive” member of the gang. Gangs were more or less divided into ethnic groups, although many had a mixture of ethnic backgrounds. Blacks, Italians, Irish and Puerto Ricans all contributed to the estimated 6,000 gang members and hundreds of gangs throughout the city. As a rule, a typical gang would only stay on their turf unless they were out fighting their rivals in their turfs. Turfs were very clearly dilineated and often there would be a “no-man’s land” between the two turfs. The “rumble” became synonomous with these gangs. A rumble was a huge fight where 20-50 gang members on each side would meet at a prescribed location, often brokered by the “warlords,” or “war counsellors” of the clubs. Often this would be a park or schoolground. The fight wouldn’t last for very long, a few minutes at the most, and the result would be broken bones, unconscious victims and even death. Sometimes a rumble would be a spur of the moment thing, and other times a rumble would be planned weeks in advance by the two war counsellors and Presidents of each gang. A big rumble between the Hawks and Rebels against the powerful Ditmas Dukes is averted in 1954. Click on “Fullscreen” to get full effect of this dramatic front-page article of the Brooklyn Eagle. Often these juvenile gangs were setup in a structured way that would make sense to any military man. There was a President, Vice President and War Counsellor. The President was usually the most intelligent of the group, usually a natural-born leader, but also tough enough to withstand any power struggles within the gang. The Vice President was similar in that he had to support the President or take over should something happen to him. The War Counsellor was responsible for setting up rumbles, scouting enemy territory and keeping an inventory of the weapons. Some gangs were large enough to have a “junior” gang beneath them. These members would “graduate” to the “senior” gang once they proved their mettle in battle or became old enough to join. Towards the end of the 1950’s the rumble was replaced with a new style of gang warfare called “japping.” Japping did not involve huge swathes of youths running into a mass of violent confusion. Instead, four or five “boppers” would sneak into enemy territory and find a rival gang member by himself. They would attack and beat him and then return back to their home turf. The weapons used in those days were different from the weapons gangs use now. Gangs today mainly use hand guns. However, the gangs back then lived in the projects and run-down tenements so they could not afford hand guns. Instead they relied on home made guns called “zip-guns,” made out of elastics and a door latch — sometimes made in the shop class at school. 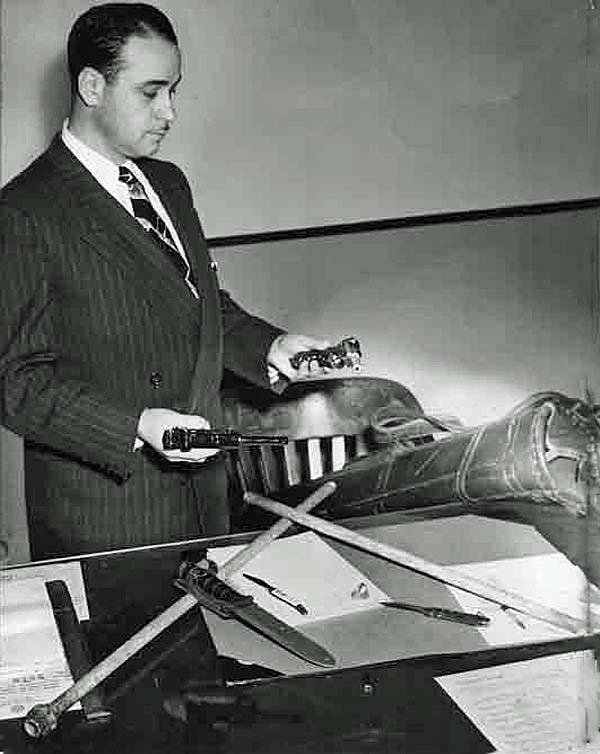 However, these guns were notoriously finicky, sometimes exploding in the face of the operator. Instead the gangs would rely heavily on fists broom sticks, rocks, bicycle chains, garrison belts, switchblades, baseball bats, car aerials and belt buckles. Some gang members would wear pointed shoes that could kick a boy to death in a matter of minutes. Stomping involved a ring of boys kicking and jumping their prostrate foe. Sometimes their shoes had metal cleats that cut into the flesh. Were these gangs really that dangerous? Juvenile delinquency, a fancy name for troubled youth (not attending school, participating in anti-social behavior) was a rising phenomenon after World War II. With each passing year new gangs sprang up, and they became larger and more violent. Rumbles were common (until japping took its place), and fights, stabbings, killings and rapes were reported in the newspapers every day. This increased gang activity raised the ire of the law abiding citizens especially whenever a particularly grisly killing would be splashed across the headlines of the New York newspapers. Two incidents in particular that galvanized New York City were the murder of Michael Farmer and the Capeman Murders. Both were particularly brutal even by the gangs’ standards. Follow the links to learn more about these crimes.